Dental implants are artificial tooth roots for tooth restoration. The dental implant procedure creates the environment for the installation of permanent replacement teeth. You can get a single tooth implant, mini dental implants or full dental implants. The required surgery imbeds titanium posts into your upper or lower jaw to attached dental caps that resemble your other teeth. Ask your dental implants Yonkers dentist about dental implants. At our Cosmetic & Implants Dentistry of Yonkers we use only the best quality medical grade titanium or titanium alloy for dental implants. Biting irregularities caused by tooth loss may make it difficult for you to eat or chew. Missing teeth can lead to other health problems, such as poor nutrition. They can also interfere with your self-confidence, especially when the missing teeth are in the front of your mouth. You may consider a single tooth implant or full dental implants to replace missing teeth, especially if you feel insecure while smiling, talking or eating. Dental implants can improve your health and your quality of life. They allow you to smile and enjoy the foods you love. The dental implant procedure is a form of prosthetic or artificial replacement dentistry — but also considered a form of cosmetic dentistry by most dental health insurance plans. Therefore, implants are not always covered. If you need dental implants — whether you need a single tooth implant, mini dental implants or full dental implants — talk to your dentist open on Saturday. At your first appointment, your Yonkers dentist examines your mouth, gums and teeth. If necessary, a dental cleaning follows that also includes X-rays of your bone structure. After the examination, your dentist explains how your bone density, oral hygiene, medical history and everyday habits affect your ability to get successful implants. Your dentist, open on Saturday as well as Saturday, shares what you can expect before, during and after the procedure. During this consultation, you can discuss options for anesthesia or sedation dentistry, depending on your comfort level. Your dentist also explains the cost of your dental implant procedure. Costs vary, based on the number and location of the teeth to be replaced. If you smoke cigarettes, your Yonkers dentist advises you to quit at least two weeks prior to the procedure. Smokers face increased risks. Plus, smoking can affect how your full dental implants — or even a single tooth implant — bond to your jawbone. If you need a graft before the implants, it may take up to a full year to fully heal. The procedure for any dental implants, even for a single tooth implant, is a two-stage affair, so you need multiple visits. But the surgery is an outpatient procedure, so no hospital visit is required. During your first visit, your dentist open on Saturdays and Sundays surgically places the titanium stubs or posts into your upper or lower jaw. Titanium actually encourages your bone to grow, so it will surround the post and hold it in place. At further visits, an abutment or extension is attached to the post, and the final crown or tooth replacement attaches to the abutment. This process alone may take up to two months. Dental implant recovery depends on a variety of factors, including your health and the number of posts needed. Obviously, you recover faster for a single tooth implant than for full dental implants. 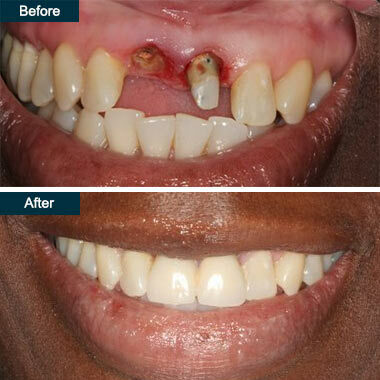 Healing from dental implant surgery typically takes four to six months. Mini dental implants use the same general dental implant procedure, but the posts are smaller. Recovery is therefore faster. Mini dental implants offer that advantage, but the disadvantage is they may not be quite as strong. However, they’re perfect for people with thinner bone densities. Once you get dental implants, maintain them with healthy daily oral hygiene habits, just like you care for your natural teeth. Whether you get a single tooth implant, mini dental implants or full dental implants, you must care for them to make them last. Failure to floss and brush your teeth can cause infection and other problems. Smoking can also contribute to implant failure, so avoid it. During your recovery period, schedule follow-up appointments with your Yonkers family dentist any day of the week, since you now have a Saturday dentist and a Sunday dentist available. With proper care, your dental implants can last a lifetime. Because of that, many people feel the dental implant procedure is worth the investment. Do you have any questions about the dental implants in Yonkers? For more information or to schedule an appointment with the best implant dentist in Yonkers of Park Avenue Smiles of Yonkers, Westchester County? Please contact our cosmetic dentistry center for consultation with the dental implants specialist Farzin Farokhzadeh, DDS.